This timeless chiffon dress is romantic and flowy—it is a gorgeous cut that flatters many women. The Sweetheart Pleated Strapless Designer Dress by Minuet is fully lined and made of chiffon fabric that has a subtle sparkle to it. 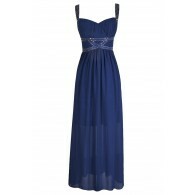 It has pleated chiffon at the bust in a crisscross overlapping design. The empire waistband gives way to the flowy A-line skirt. 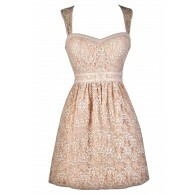 The lined and lightly padded bust gives support and an invisible back zipper completes this pretty dress. The Sweetheart Pleated Strapless Designer Dress comes in two great color choices and would be perfect paired with pumps or strappy heels and a clutch. This dress is a classic style you’ll wear over and over again. Also available in Berry. Details: Fully lined. Invisible back zipper. Lined and lightly padded bust. 95% polyester, 5% lurex. Lining: 95% polyester, 5% spandex. Dry clean only. Small measurements: Length from top of bust to hemline: 28”. Bust: 32-34”. You have added Sweetheart Pleated Strapless Designer Dress by Minuet in Ivory Sparkle into Wishlist. You have added Sweetheart Pleated Strapless Designer Dress by Minuet in Ivory Sparkle for Stock Notification. You have set Sweetheart Pleated Strapless Designer Dress by Minuet in Ivory Sparkle as a loved product. 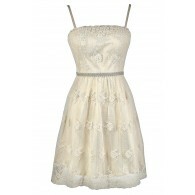 You have removed Sweetheart Pleated Strapless Designer Dress by Minuet in Ivory Sparkle as a loved product.